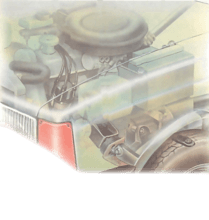 Tasks performed by ancillaries The distributorchannels high-tensionelectricity to thesparkplugs to ignite theair/fuel mixture Oil-filler cap The petrol pump feedspetrol to the carburettor. 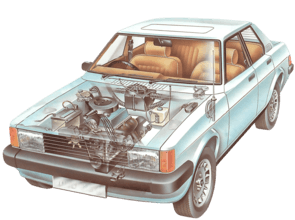 The starter motorrotates thecrankshaft to startthe engine. The oil pumpdistributeslubricating oilunderpressure. 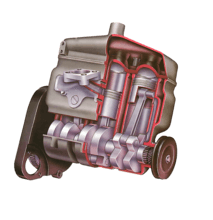 The belt-drivenwater pumpcirculates thecoolant. The generatorproduces electriccurrent to charge thebattery. The low-tension (LT) voltage passes through a primary winding in the coil and then to the contact-breaker points in the distributor. Each time the low-tension-current circuit is interrupted by the opening of the contact-breaker points in the distributor, the electrical surge as the current suddenly collapses induces high-tension (HT) voltage in a secondary winding in the coil.